I share a lot of outfits that are suitable for work or an evening occasion, but maybe it’s time to talk about what to wear in the weekend and your free time in general? How can you put together an outfit that looks stylish, feminine, yet comfortable enough to wear for brunch, a walk in the park, a lunch date, a family reunion and maybe more? Let’s channel our spring – summer style with this cute feminine look. I consider skirts, especially these types, an essential closet staple for this season. Even though they are not a true “classic” item they give the look a very feminine touch. As you can see in my previous post HERE when I styled the same skirt for a more evening date night look, they are also very versatile. So for me this is a classic piece that I am very happy to have in my wardrobe, as well as the similar skirt from HERE and HERE. 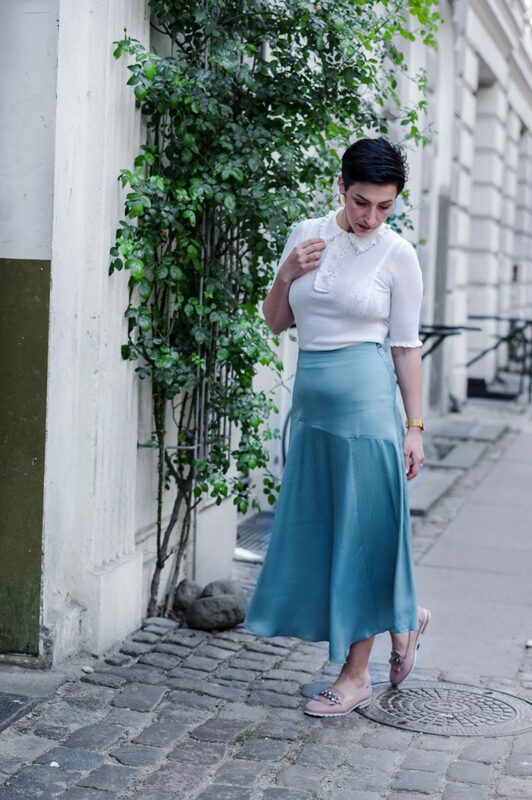 While this skirt can be paired with many other colours, I found white to best fit my personal style but you can see an example of this skirt paired with another colour: HERE. When it comes to a classic white t-shirt, as much as I like the really comfortable baggy ones that people often use as pijamas, I also feel grateful when I find pieces with unexpected textures that can help create visual interest, and this top is the perfect example of that! So could this t-shirt be a statement piece? Yes, you can say that, it’s not the white classic shirt that you wear for work but it can be your weekend statement piece that you wear with denim, skirts, shorts and more. It is actually a bit unusual for me to take photos without wearing heels, but to be honest this type of outfit is what I often wear on a daily basis outside of the blogging world. Since I usually categories my closet into work, casual and formal wear, I like having pieces that are multifunctional like these ones for example: a flirty skirt HERE (my staple piece) and the white t-shirt with the pretty details, HERE. They are big time savers and most importantly money savers as well. What do you think of this outfit? Does this fit your casual weekend outfit category? What else would you style it with?